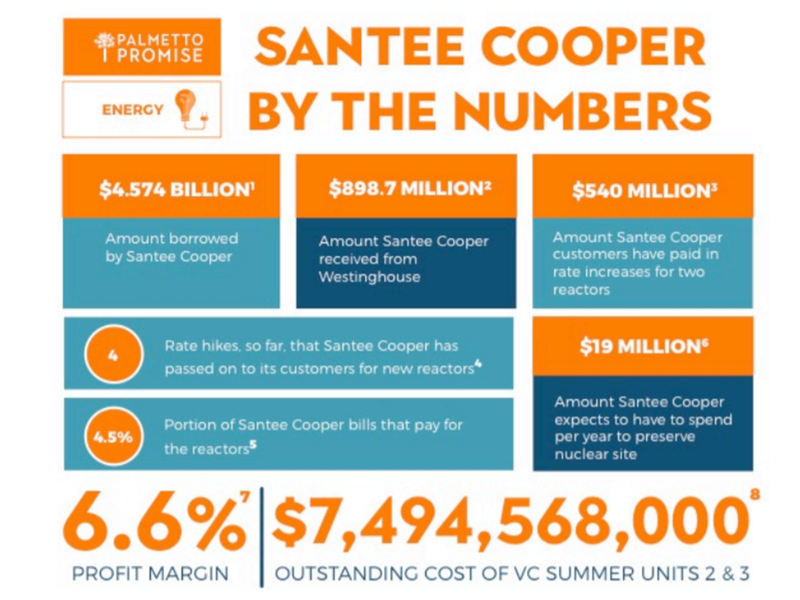 The instability of Santee Cooper and its looming $4.5 Billion in debt for nuclear assets that will generate no electricity is harmful to real people and to economic development. As the sheer magnitude of the V.C. Summer Units 2 and 3 nuclear abandonment, the largest financial disaster in South Carolina history, comes more into focus, we know Santee Cooper has borrowed $4.5 Billion to date, its customers have already paid $540 million in four rate increases for the two defunct reactors, and the interest owed grows daily. 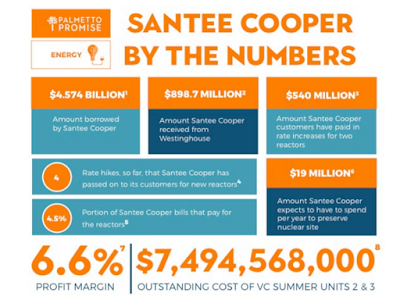 Additionally, Santee Cooper has another $4 Billion in nonnuclear debt that must be addressed. In total, Santee Cooper’s debt with interest is more than the entire state General Funds Budget for FY 2017-2018. • From a historical perspective, Santee Cooper is unique. Facing the future, that uniqueness has both benefits and baggage. 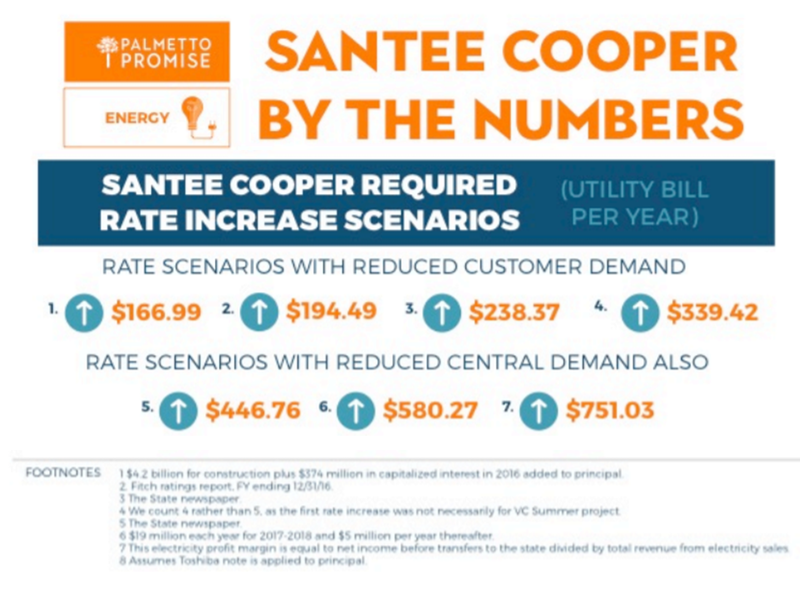 • Santee Cooper has a symbiotic relationship with the Electric Cooperatives, especially after “The Agreement,” their most recent power contract of 2013. • Santee Cooper has endangered economic development by antagonizing an industry it has been charged with serving. 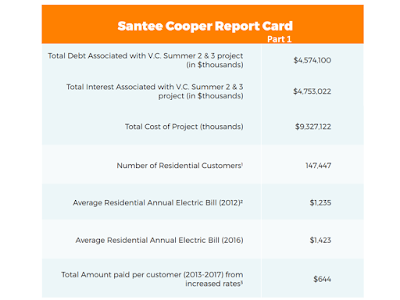 • Santee Cooper doesn’t have a unique economic development motivation or ability among utilities. 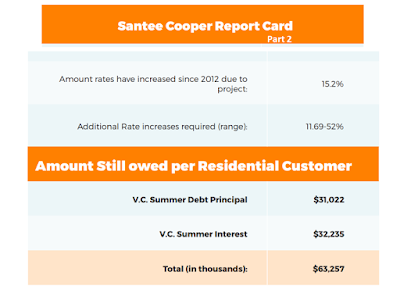 • Santee Cooper’s rates are not an advantage for ratepayers after all. • Residential rates for Santee Cooper customers are going to rise, not only because of VC Summer but because of the utility’s ongoing struggles to match its load capacity with customer demand as well as its operating debt of $4 Billion. • The public is supportive of the sale of Santee Cooper. • An outright sale would have the benefit of getting the government out of the electric utility business. 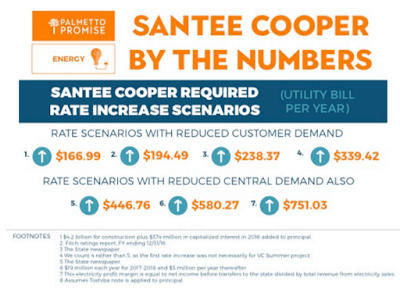 Our economic research shows that future annual Santee Cooper utility bills will increase, anywhere from $166.99 per customer to upwards of $751.03, depending on demand elasticity for Santee Cooper electricity, the total debt and interest associated with the abandoned project, and Santee Cooper’s relationship with its largest customer, Central Cooperative. Electricity rates would need to increase between 10-52%. Our analysis suggests a likely additional 13.62% rate increase, which would mean the average annual electricity bill increases by $194.49. This increase would be in place for the next 38 years, until the debt is paid in 2056.